Two birthdays in three days. It’s enough to make this mama feel old. Our daughters’ childhoods, which marched boldly through the front door a few short years ago, are now slipping quietly out the back door and fading away. The oldest turned twelve. 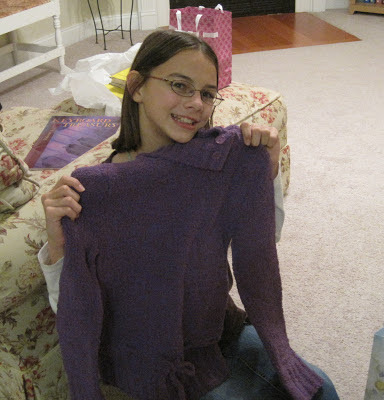 Thankfully I have a whole ‘nother year until she turns thirteen ’cause I’m a bit apprehensive about having a teenager. The youngest turned ten. No more children with ages in the single digits. See why I’m feeling old?! I love how different they are from each other, how they are growing and changing, developing likes and dislikes that make them such unique individuals. Yet there’s so much I want to teach them and the time is growing short. They’re old enough now to recognize my moods. It’s harder to hide my weaknesses. I think they’ve realized that Mom isn’t perfect; she needs help, too. The way our family interacts today will look slightly different a year from now….and different again the year after that. But I cannot live in the past or the future. My youngest is calling for me to help with a puzzle she got for her birthday, so I will go and seize these moments of childhood while I can. I can't imagine having children in double digits, much less all of them there. Wow! I'm sure that does take some getting used to. Your girls have their birthdays within three days? That's a lot of cake in one week! Our oldest's birthday was on Saturday and she requested chocolate cake with chocolate icing. 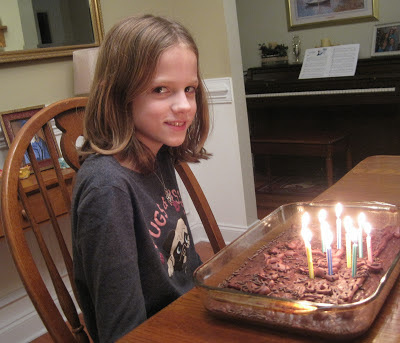 Our youngest's birthday was Monday and she had brownies with chocolate icing and chocolate sprinkles. We also had ice cream with both so I think we've all gained a few pounds!!! We're down to just a few brownies left….